25 Grams of Cold Blue Steel kandy Pearl. Works in all paint, powder coat, gelcoat, nail polish, concrete sealers. These pigments work with any base clear, blender or binder for a fantastic paint job! 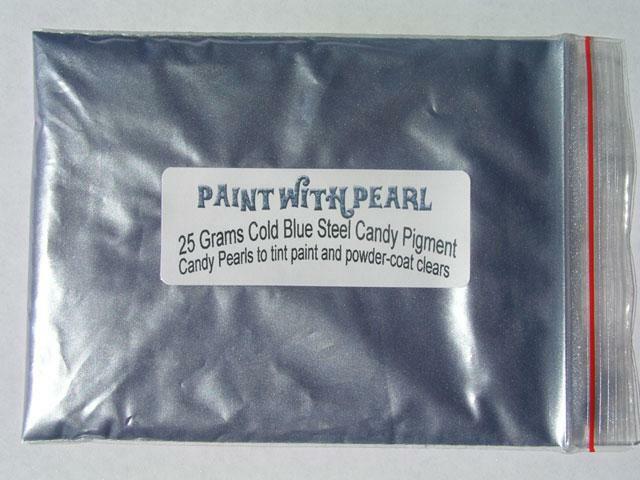 This 25 gram bag of Cold Blue Steel kandy Pearl Pigment powder is a great pigment for creating your very own tinted clears and opaque metallic in kustom auto or home paint or powder-coating applications. It is guaranteed to mix well with any clear paints or tinted kandy paints, and has a temperature threshold of about 400 degrees fahrenheit. It is a very fine powder and will spray well through airbrushes, powder guns, and HVLP paint guns. It is very light, so it stays well mixed in paint without settling too fast in your gun, and can make great tinted clears for light to heavy effects (it’s your choice). One 25 gram bag of Cold Blue Steel kandy Pearl treats from 1 to 2 quarts of clear. 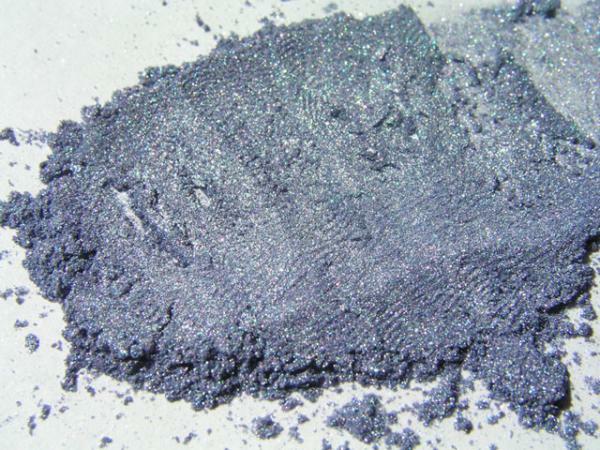 This Cold Blue Steel kandy Pearl pigment is so versatile, it can be used in any clear mediums, like concrete and tile sealer, leather finishing, or faux finish! At Paint With Pearl, we pride ourselves on the quality of our kandy pigments. These are quality metallic Iron Mica colored pigments that have a good deal of their own iridescence built right in. The mixture, however, of our kandy pigments will never be truly transparent, due to the fact that they are solid particles of mica and iron. This does not mean that you can’t achieve a good degree of transparency from the kandy paint pigments, it’s just that you will achieve total coverage after several coats, being unable to see whatever is underneath. We suggest using about 1/2 of one of our bags per quart of base clear or inter coat clear. Using a full bag per quart would basically make a colored metallic Cold Blue Steel kandy pearl paint. If you are still confused over which products would look good over your existing paint, or want to discuss your options, contact us! As always, we will try to answer any of your questions and hope to serve our kustomers in any way that we can! Visit or FAQ page for more answers to questions. We thank you for your business. 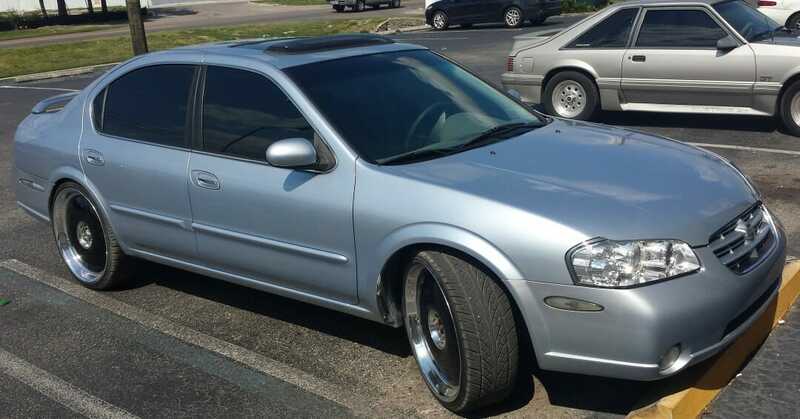 Not only are all of our kandy Pearl pigments completely compatible with vehicle dip, we were the first to supply the dip companies with pigments. 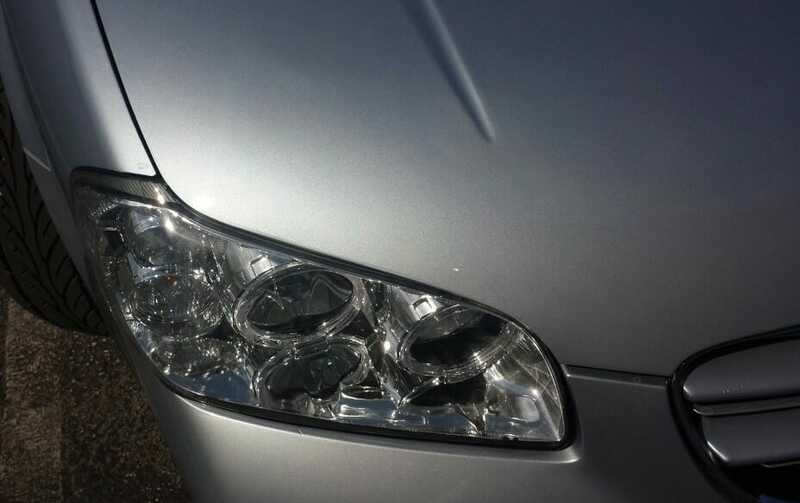 If you have any reservations about whether our products work in vehicle dip, you should know that we were the pioneers who introduced Plasti Dip Pearls to the world. We at Paint With Pearl appreciate all of our kustomers who take the time to send us pictures and feedback on all of our products. Our Kolor Pearls, Metal Flakes, True Chameleon pigments, Thermochromics, Glow In The Darks and all other paint pigments are truly kustom paints and can be used in almost any application. There are so many options with our products! Photos, Videos and testimonials are a great way to show off the capabilities of our additives. If you find the opportunity, send us some great pics and a small testimonial about what you did with our products and we will send you a gift card for the website. We love to show off the work that our wonderful kustomers are doing. Contact us and send us your work! Our 25 Gram Bag of Cold Blue Steel kandy Pearl can treat 1 to 4 quarts of any clear and can be mixed into any Solvent or water based clear paints. 25 Gram Bag of Purple-Pink kandy Paint Pearl Night Shade. 400ºF Temp Threshold. Use in 1 Sprayable Quart of Base Clear, or 1 lb. Powder Coat. 25 Grams of Apple Green kandy Pearl. Works in all Paint, Powder Coat, Gelcoat, Nail Polish, Concrete Sealers. 25 Grams of Black Emerald kandy Pearl. Works in all Paint, Powder Coat, Gelcoat, Nail Polish, Concrete Sealers. 25 Grams of Deep Pink kandy Pearl. Works in all Paint, Powder Coat, Gelcoat, Nail Polish, Concrete Sealers Shoe paint, Everything. This 25 gram Shimmer Orange Copper Kolor Pearls powder is a great pigment for creating your very own tinted clears in paint or powder-coating applications. It is guaranteed to mix well with any clear paints or tinted kandy paints, and has a temperature threshold of about 400 degrees fahrenheit. It is a very fine powder and will spray well through airbrushes, powder guns, and HVLP paint guns. It is very light, so it stays well mixed in paint without settling too fast in your gun, and can make great tinted clears for light to heavy effects (it's your choice). One 25 gram bag Of Shimmer Orange Copper Kolor Pearls ® treats from 2 to 4 quarts of clear. 25 gram Pewter Titanium Kolor Pearls ® powder for paint, powder-coat, and any other clear medium. 400ºF Temperature Threshold. 25 Grams of Shimmer Sky Blue kandy Pearl. Works in all Paint, Powder Coat, Gelcoat, Nail Polish, Concrete Sealers. 25 Gram Bag of our Gunmetal Black Kolor Pearls. 400 degree Temperature Threshold makes it great for powder coating, paint, and any other coating. High UV tolerance. 25 Grams of Shimmer Gold kandy Pearl. Works in all Paint, Powder Coat, Gelcoat, Nail Polish, Concrete Sealers. 25 Grams of Purple kandy Pearl. Works in all Paint, Powder Coat, Gelcoat, Nail Polish, Concrete Sealers. This 25 gram bag of Lime Green kandy Pearl powder is a great pigment for creating your very own kandy paint or tinted clears in paint or powder-coating applications. It is guaranteed to mix well with any clear paints or tinted kandy paints, and has a temperature threshold of about 400 degrees fahrenheit. It is a very fine powder and will spray well through airbrushes, powder guns, and HVLP paint guns. It is very light, so it stays well mixed in paint without settling too fast in your gun, and can make great tinted clears for light to heavy effects (it's your choice). One 25 gram bag of Lime Green kandy Pearl treats from 1 to 4 quarts of clear. This 25 gram bag of Mauve Rose Red kandy pigment Pearl powder is a great pigment for creating your very own tinted clear in paint or powder-coating applications. It is guaranteed to mix well with any clear paints or tinted kandy paints, and has a temperature threshold of about 400 degrees fahrenheit. It is a very fine powder and will spray well through airbrushes, powder guns, and HVLP paint guns. It is very light, so it stays well mixed in paint without settling too fast in your gun, and can make great tinted clears for light to heavy effects (it's your choice). One 25 gram bag of Mauve Rose Red Kolor Pearls treats from 1 to 4 quarts of clear. 25 gram bag of Royal Blue kandy Pearl powder for kustom Paint, Powder coatings, Nail Art, Fiberglass, and any other clear mediums. 400ºF temp threshold. This 25 gram Forest Green kandy Pearl powder is a great pigment for creating your very own special tinted clears in any kustom paint or powder-coating applications. It is guaranteed to mix well with any clear paints or tinted kandy paints, and has a temperature threshold of about 400 degrees fahrenheit. It is a very fine powder and will spray well through airbrushes, powder guns, and HVLP paint guns. It is very light, so it stays well mixed in paint without settling too fast in your gun, and can make great tinted clears for light to heavy effects (it's your choice). One 25 gram bag treats from 2 to 4 quarts of clear. Use in paints or any industrial finishes or coatings. This 25 gram Satin Royal Gold kandy Paint Pearls® powder is a great pigment for creating your very own tinted clears in kustom paint, faux finish, or powder coating applications. It is guaranteed to mix well with any clear paints or tinted kandy paints, and has a temperature threshold of about 400 degrees fahrenheit. It is a very fine powder and will spray well through airbrushes, powder coating guns, and HVLP or standard paint guns. It is very light, so it stays well mixed in paint without settling too fast in your gun, and can make great tinted clears for light to heavy effects (it's your choice). One 25 gram bag Of Satin Royal Gold kandy Paint Pearls treats from 1 to 4 quarts of clear. It is non-reactive to any clear medium, so it can be used in powder coatings, screen printing, airbrush paint, and is also often used in faux finish, and even leather work. Works well in any industrial finish or coating.